Finally, a new Shih Tzu hairdo! Of course, please be gentle in criticizing my novice grooming skills. 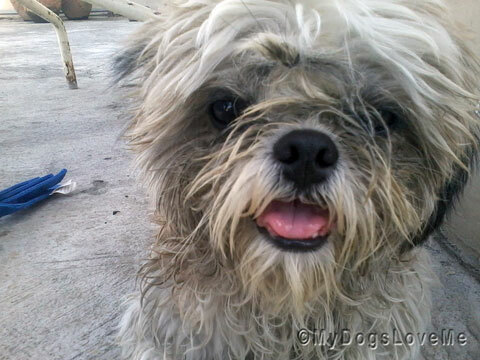 Apparently, Buchi loves his dirt... and rain... and wallowing like a tiny carabao in the mud. Super Duper Dirty Shih Tzu! 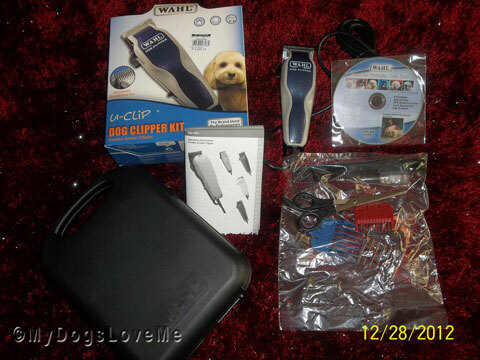 A Wahl U-Clip Dog Clipper Kit from Pet Express SM MOA orignally costing 4,249.75 php. We got it discounted at 20%. This is what I used to clip the newly bathed (YEAH! Smells good...) Shih Tzu's (e.g. sounded a lot better than Buchi) chrysanthemum and the occipital area (dog's back). Jargon-y! Viola! Better looking but still subject for improvement! So Buchi isn't the most cooperative grooming model YET... Neither am I the a good groomer at the moment... but I do hope I'll eventually get it right in due time. By the way, Buchi doesn't like treats or toys (he just wants to hump so I'm still trying to figure out what could motivate him for good grooming behavior). I'd like to thank the Furries of Whisppy's Mom for inspiring me to get my own dog clippers and groom the two most adorable Shih Tzus of my life. Buchi looks adorable!! And what better way than to have you both learn at the same time. :) Grooming is fun once you get the hang of it and I'm sure you both will. Does Buchi like lots of kisses and praise? Calming music might help. Make a game out of it. You'll figure it out. Good luck! Well done...our mom wouldn't even try grooming us so we are giving you an A+ for effort. Great job there. My peeps grooms my furs but I don't like it as I like to get down and get dirty. Have a terrific Thursday. Thankfully Whisky is very well behaved when being groomed though now that she's a senior girl, she tires easily so grooming has to be really quick! Looking good there Buchi, however Mom, that first picture looked awesome, cause fun was a hand, yes dirt, rain, mud and all stinkie, what could be better then that for furs! He looks pretty good to us but, hey, hair always grows back...much too fast if you ask me! but we must say you Mom did and amazing job on your home hair cut, you look pawsitively fabulous! 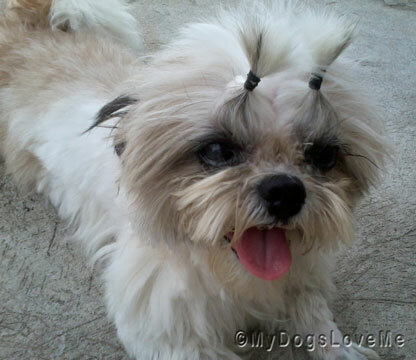 Well, WE think Buchi looks PAWEsome, especially in little ponytails like that! Bucchi looks very tres chic! Great job. Becks, Josh and their two standard poodles Daisy and Maple are staying with us for an extended time. They just relocated from California to Albuquerque with dreams of finding careers and settling done to a new life here. We met through our blogs...isn't that the best? That's a great first effort! But no baths for me thank you! woo woo woo! I think you did a GREAT job. I wouldn't know where to start. Yes, you did a great job. You should see how Scrappy and Willa look after My Vickie is through with them. It is shameless, how she leaves them. They are emberrassed to go outside or be seen by their friends. I never thought to pull pig tails up to keep the hair out of the eyes! not that my pup needs it, but I will pass the tip along! I thought I was the only one who did that to my shih tzu. I am not alone!